This species is accepted, and its native range is Tropical America. Nativa y cultivada en Colombia; Alt. 375 - 375 m.; Llanura del Caribe, Valle del Magdalena. Bolivia, Brazil North, Brazil Northeast, Colombia, Costa Rica, Ecuador, French Guiana, Guyana, Leeward Is., Peru, Suriname, Trinidad-Tobago, Windward Is. Adenocalymma pachypus (K.Schum.) Bureau & K.Schum. Adenocalymma sagotii Bureau & K.Schum. Acevedo-Rodríguez, P. (2005). 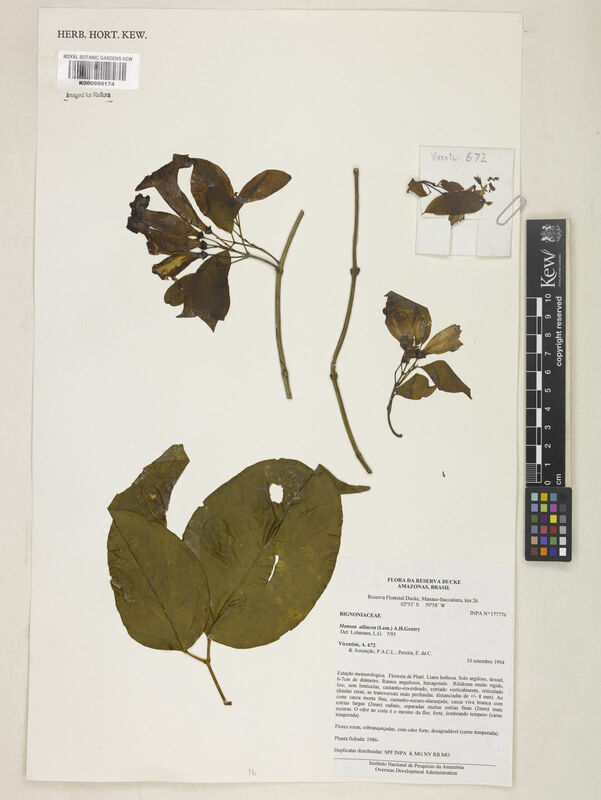 Vines and Climbing Plants of Puerto Rico and the Virgin Islands Contributions from the United States National Herbarium 51: 1-483.